You will earn 1,072 Reward Points. Earn 1 reward point for every 1 dollar spent. 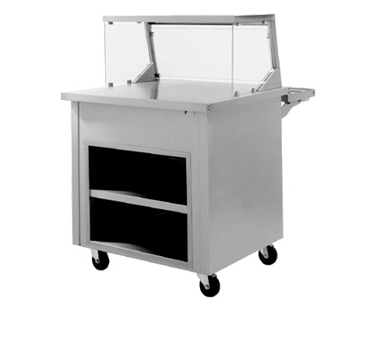 Exterior top is constructed of 14-gauge stainless steel, welded, ground and polished into one integral unit. Top is fabricated with square exterior corners. Casters unit is mounted on 5” (12.7cm) diameter swivel casters with non-marking polyolefin tires and plate brakes. Overall height of caster assembly is 6” (15.2cm). Exterior body is constructed of 18-gauge stainless steel side panels and 14-gauge galvanized bottom. All exterior side panels are reinforced with overlapping corners and are welded in place. All body cutouts are reinforced with 14-gauge galvanized channel supports. SC units have a one or two door dry compartment(s) constructed of 18-gauge stainless steel. Each compartment is equipped with stainless steel shelf; door(s) are double-wall construction, with stainless steel front panel. Note: Inclusion of these options will alter the electrical specifications of unit.